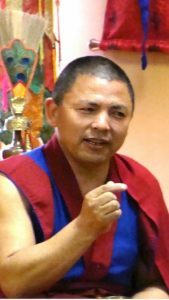 We are pleased to have Khenpo Ratsa Geshe Tenzin Dargye back at Yeru Retreat Center to teach the ancient teachings of Tibetan Healing Bowls. Khenpo Ratsa Geshe Tenzin Dargye, a Geshe from sMenri Monastery and a master in Tibetan healing, will teach us how to use the sounds and vibrations of the Tibetan Singing Bowls to complement your existing healing practice and for your personal healing. By the end of this retreat, you will understand the history and ancient lineage of Yungdrung Bon’s use of the Tibetan Healing Bowls. 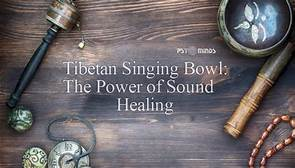 You will learn the different techniques for bringing out the sounds and vibrations from the Tibetan healing bowls. You will learn healing bowl placements for, around, and on the body. GesheLa will discuss the different ways to use the Tibetan Healing Bowls for specific therapies and treatments to ease depression, anger, stress and more. You are welcome to bring your Tibetan Healing Bowls and Gongs for this retreat. If you do not have any Tibetan Healing Bowls, do not worry. Yeru Retreat Center has them available for students to use. Yeru Retreat Center, located in Emily MN. Yeru Retreat Center is a private resort surrounding Garuda Lake. Peaceful, healing and energizing. The perfect background for this retreat. Two and one-half hours by car from Minneapolis. You can fly into Minneapolis airport, rent a car or sign up for a Yeru Shuttle. Or, you can fly into the Brainerd Lakes Regional Airport (30 minutes from the Retreat Center), Learn more about the Yeru Retreat Center here. Yeru Bon Center will arrange for a shuttle to pick up a minimum of 7 travelers arriving at the MSP airport. The pickup will be at one specific time and place (Minneapolis Airport). The Shuttle leaves the day before this retreat, on June 20, 2019 at noon and will not return until June 25th, 2019 at 8:00 a.m.
We strongly advise students not to make any travel arrangements on the day the retreat ends and not until after 1:00 p.m. The retreat center is located 2.5 hours from the airport barring no traffic or long stops. If you need to have different travel options, we advise you to rent a car at the airport and take the beautiful drive to the retreat center. Then you can arrive later, the day before, or leave right after the retreat. The retreat will start on time. No one will be allowed into the retreat after the retreat has started. It is also requested students stay until the end of the retreat. This keeps the energy and group more cohesive. Sleeping Huts – Very cozy and private. All huts have beds, small table and chairs. Yeru Yurt/Tent – Very Glamping Cozy. $580.00 $655.00 Sleeping Hut Single – Cozy sleeping hut facing the lake. $525.00 $600.00 Sleeping Hut Double Cozy sleeping hut facing the lake. If you prefer, you can stay at one of the hotels in the area. You will need to arrange for transportation to and from Yeru Retreat Center daily. 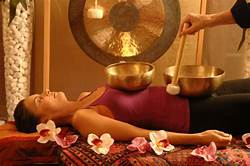 Your fee will include retreat, housing, meals, the joy of Garuda Lake and our retreat center During our last Healing Bowl retreat, we were serenaded with Healing Bowls and Gongs by Frank DeCristina, Harmonic Sound Therapist and Instructor. Housing will be determined by first come, first serve. When you make your full registration, you will be given housing options. Register early to be sure you have the housing you would like. Meals are included in your fee for the entire retreat. Fresh non-processed meals will be available for everyone. We can accommodate vegetarian, Vegan, gluten-free and Meat diets. Your fee is refundable, less a $75.00 processing fee 30 days prior to the start of the retreat. 50% refund within 30 days of the start date of the retreat. No refund within 3 days of retreat, but we will apply this payment to a future retreat.